The R290NS 800W Compact microwave is a fantastic little addition to any home or campervan. It's sophisticated stainless steel finish and great compact size means it can fit easily into your kitchen, leaving you with more bench space. And with great features and locally developed Auto Menus, you'll find defrosting, cooking and reheating at home a breeze. 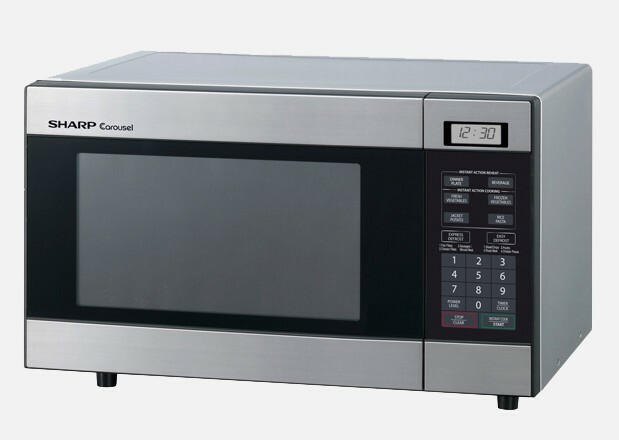 This microwave has an output power of 800 Watts to enable you to defrost, cook and reheat all of your favourite dishes. Easily defrost 500g of popular varieties of meat using this pre-programmed Auto Menu Defrost feature. For easy and efficient defrosting, cooking and reheating of popular menus, use Sharp's pre-programmed Auto Menus. 13 Auto Menus have been included in this microwave for your convenience. When it comes to saving space in your kitchen, you don't want to crowd your bench with large and bulky appliances. However, if you don't want to miss out on all of the convenience and simplicity of microwave defrosting, cooking and reheating, why not consider Sharp's Compact sized microwave oven. This stylish little microwave easily fits into your kitchen while not taking up a lot of bench space. The locally developed Auto Menus on this microwave are fantastic for everyday defrosting, reheating and cooking of popular dishes. The R290NS microwave is pre-programmed with 13 Auto Menus including Auto Reheat menus, Auto Cook menus, Easy Defrost menus and Express Defrost menus. There is no need to stress over frozen meat which you have forgotten to defrost. This wonderful and easy feature is so convenient when it comes to defrosting propular varieties of meat. Our Sharp test kitchen has already determined the correct power level and the appropriate defrosting time for 500g of meat. With no need for guesswork, you can ensure your meat is thoroughly defrosted. Sharp microwave ovens make it easy to prepare healthy meals quickly with food that looks and tastes great. All menus, food groups and recipes for Sharp microwave ovens are developed and tested with the NZ consumer in mind. The experts in the Test Kitchen have carefully complied menus to suit local tastes and ingredients for popular foods. Using these menus helps to achieve optimum results with ease. Sharp invites you to enjoy the fantastic flavours possible with a Sharp Microwave Oven.